I am sure many of you have noticed when passing by a pasture full of cows, each one usually has a bright tag on their ear. These tags usually contain numbers and other various information in order to identify the cow and be able to keep records on them throughout their cow life! Calico being a small raw milk dairy takes it one step further, our cows are not just numbers, but they also have names. In order to never get in the habit to call them by their number we often make them a name tag that goes over their number tag. At big commercial dairies they are referred to by their number, there is no real interaction, the main goal is to get as much milk as possible and get the cow out of the barn. Our approach is much different, besides calling each cow by their given name they also recieve plenty of attention from everyone that works on the farm. 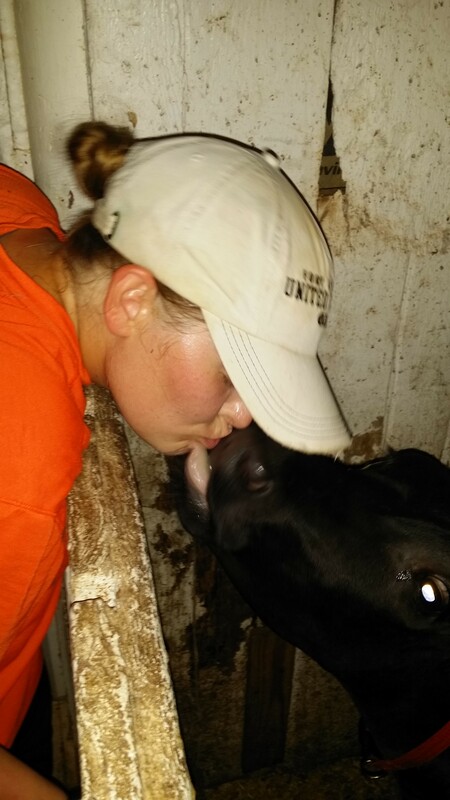 Many of our cows recieve lots of loving and personal interaction. Just like dogs, each cow has their own personality and quirks. We never refer to them as pets, but each of us here at Calico has a different relationship with each cow we work with.